Lisa dives into the major scale and demonstrates a commonly used pattern. I have been having private lessons and had learnt the natural major scale but this is slightly different as it has a F# instead of F is this just a different variant? Sequence ascending and descending in the tabs look different. Is this an error? 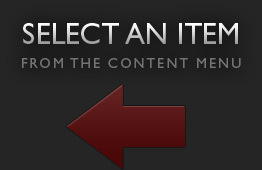 Pattern 2 is missing, can it be sent out in a PDF or will you cover it in some other way? hi lisa,when u say this is the 2nd position in D major isnt it really the 3rd position as the root is on the A string 5th fret & on the B string 3rd fret..what am i missing?? Lisa will guide you through the basics of electric guitar with a rock and blues flair in this series. Lisa jumps right into your first "open" chords. She demonstrates how to play these chords in detail, so you can begin playing some simple progressions on your own. Lisa picks up right where she left off in her last lesson. Here she demonstrates some additional bass walk downs that can be used to intensify your guitar playing. Lisa explains triads in this lesson. Simplistic and unique, yet powerful and bold, these little guys will allow you to explore some fresh new sounds on your guitar. Lisa introduces the blues shuffle. You will learn several chordal variations on this classic rhythmic pattern. Lisa introduces the I, IV, and V chords. She explains how these chords can be found in any key by counting up the musical alphabet. Lisa breaks explains how the left can be used to mute the strings within a funky, syncopated groove. She provides a few practical exercises that will help you become acquainted with this technique. Lisa demonstrates a short and juicy lesson on reggae strumming patterns. Most reggae patterns are played in 4/4 time with a strong emphasis on each of the upbeats. In Lisa's 16th lesson of her Beginner Electric Series, she reopens the topic of syncopated rhythms. Lisa covers some warm-up exercises that are beneficial for both the left and right hands. Lisa presents a small lesson on the slide technique. This technique can be used with scale patterns to help create a more expressive and personal sound. Lisa teaches a classic rock lick that combines the pull-off technique with a pedal tone. Lisa covers the hammer-on technique. This technique is essential for all guitarists to master. Lisa simplifies and breaks down some chords commonly used in the blues and jazz genres. An interval is the musical distance between two different pitches. Here Lisa covers the 6th interval and some practical ways that it can be used. Lisa introduces the minor blues scale. This scale, which adds the b5 degree to the minor pentatonic scale, is one of the most commonly used scales in almost all styles of music. Taking things back to the SRV sound, Lisa demonstrates this Texas style rhythmic shuffle. She breaks this pattern down by demonstrating its bass line and the muting techniques required to play it. Lisa takes a quick moment to cover this unique chord. Some dub E7(#9) as the "Classic Hendrix Chord." However you see it, this colorful sound is an essential addition to your guitar toolbox. Lisa will cover a metronome technique that will help develop faster chord changes. Lisa provides some great tips on how to set up and organize a practice session that will maximize progress. Lisa dives into some beginner music theory and discusses how to use a mnemonic system to remember note locations. Lisa takes a look at how to build minor chords. She explains the crucial difference between major and minor chords. Lisa explains some important theory information pertaining barre chords. Lisa breaks explains how to find the appropriate barre chords within a I-IV-V blues progression. Lisa takes a quick look at how octave shapes are created and where they can be found. Lisa demonstrates some ideas on how to improvise using intervals. She begins with the perfect fourth interval for this lesson. Lisa continues her last lesson by explaining how 5th and 6th intervals are frequently used in melodic lines. Lisa explains how to play the C major scale using the 'G' shape from the CAGED system. In this lesson, Lisa demonstrates how syncopated rhythms work and the different ways they can be applied within a 16th note or triplet-based rhythm. Lisa explains how chord shapes and scale patterns relate to one another. Moving all the way up the neck of the guitar, Lisa demonstrates major triads and explains the fundamentals of how they are built. Lisa now goes on an in depth adventure into minor triads. 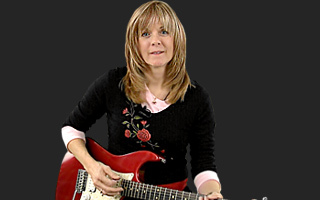 In this quick lesson, Lisa touches on some minor arpeggio ideas. Lisa demonstrates how to use different scales to create new ways of building both solos and rhythmic styling. She utilizes a backing track to help make her point. Welcome to the 46th lesson in Lisa Pursell's Beginner Electric series! This lesson covers many creative ideas as well as the techniques behind single and double string slides. Enjoy! Lisa demonstrates a few practical examples of the pull-off technique. Lisa takes a dive into the minor blues scale as a whole. She demonstrates where you can find what are called "blue notes" within pentatonic scale patterns. Vibrato is a fantastic and simple technique to understand. This lesson offers different ideas on how you can apply some vibrato to your playing. This lesson provides an in depth look at both downward and upward sweep picking techniques. Want to play a lighter voicing of a full chord? This technique is called "shells" and Lisa demonstrates several common shell voicings in this lesson. Lisa explains how to harmonize the major scale with diatonic triads. Lisa lays down an improvised 8 bar blues solo with the help of a backing track. Then, she discusses how she created her lead lines. Lisa continues to demonstrate ways to harmonize notes utilizing diatonic triads. She provides some tips on how to improvise with these triads as well. Lisa demonstrates ways to connect patterns using melodic sequences. She moves up and down the neck and provides some ideas that will help you make your own sequencing connections. Lisa takes a quick look at how to add the "blue note" into the A minor pentatonic scale. This in depth lesson explains how to harmonize the major scale while utilizing the entire neck of the guitar. Lisa demonstrates the F#m7(b5) chord and the different places it can be played on the neck. Lisa will use the C Major Add 9 chord shape to help demonstrate how extensions can be used to spice up an arpeggio. Utilizing some of the scale work from previous lessons, Lisa touches on the topic of passing tones and demonstrates some examples accompanied by a backing track. This very quick lesson explains the theory behind the chord progression used in the last lesson. Want to learn some fresh sequencing ideas in A major? Lisa provides two ideas that can be applied to a new solo or melody. Lisa provides some insight on how to successfully utilize a metronome during a practice session. Lisa discusses some creative ideas on how to apply 9th chords to your rhythm playing. Welcome to Lisa's 67th lesson! Here she provides some creative double stop ideas that can be applied to many different keys. Lisa demonstrates a swing blues intro lick in the key of C.
About Lisa Pursell View Full Biography Born and raised in Atlanta, GA, Lisa started playing local venues as a teenager in and around Atlanta as a guitarist for hire. At the same time, she began teaching guitar privately and playing locally on recording sessions. In this still-early stage of her career, she was soon teaching at local music stores. After attending a local college and studying classical guitar, she began teaching at the Atlanta Institute of Music. In 1992 she moved to Hollywood, CA. to attend the Guitar Institute of Technology (a.k.a. Musician's Institute). Graduating in 1993 as "Outstanding Student of the Year," she was invited to become part of the faculty at GIT, which she excelled at for the next three and a half years. In 1996 she moved to Nashville, TN. There, she was hired as the lead guitarist for Nashville based band Mustang Sally, which at one point included future Grammy winner Gretchen Wilson as the lead singer. She played an exhaustive tour schedule of 150-300 dates a year, while perfecting her technique. Soon the band was opening for artists such as George Jones, Patty Loveless, Montgomery Gentry, Chuck Mangione, LeAnn Womack and many others. In 2003, she recorded an instrumental CD which included one original track co-written with bass player Jerry Peek (Steve Morse Band), along with two covers of two of her many favorite guitarists. To further hone her musical skills, she then concentrated on songwriting, the results of which will be included as both vocal and instrumental pieces on her next project. Today Lisa resides in Nashville, TN. Currently an educator, author, singer/songwriter/guitarist, she plans to release her original CD soon. Her music theory workbook, entitled "THINKING IN THE LANGUAGE OF MUSIC" written for vocalists and musicians who are interested in learning music theory without the requirement of reading music, is currently available.